Cookbook Tour of NYC continued. . . the books and the places. Prune – This cookbook is designed to mimic the kitchen binder used by staff in the restaurant. The recipes are minimalist and they offer a look inside the chef’s personal flavor sensibilities, producing dishes that could be called “in the Prune style” without a feeling of being constrained by it (at least, I don’t feel constrained as a non-staff member – staff presumably feel constrained). It succeeds in capturing the feel of the food and this is the first cookbook I’m picking up once I get home. (Actually, don’t take that statement too seriously because now I’m realizing I feel that way about all of them). I had pickled shrimp, hay & straw pasta with green tomatoes and chicken livers, and almond semi-freddo. Momofuku Milk Bar – This book features desserts that borrow across genres for flavor inspiration, mostly cookies, cakes and pies borrowing from breakfast cereal, candy bars, and junk food. 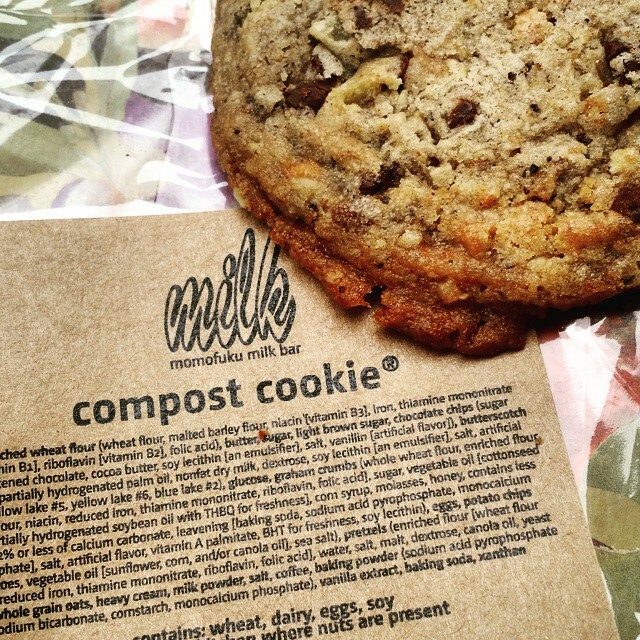 I am sure that there are Momofuku Milk Bar establishments out there that taste wonderful. The cookie I got tasted like an aged something I might have grabbed off a rack at the convenience store. Except I wouldn’t grab those cookies at a convenience store because I never take the ones that I would bake at home! I only take the kinds I don’t bake at home! And I will continue to do so. 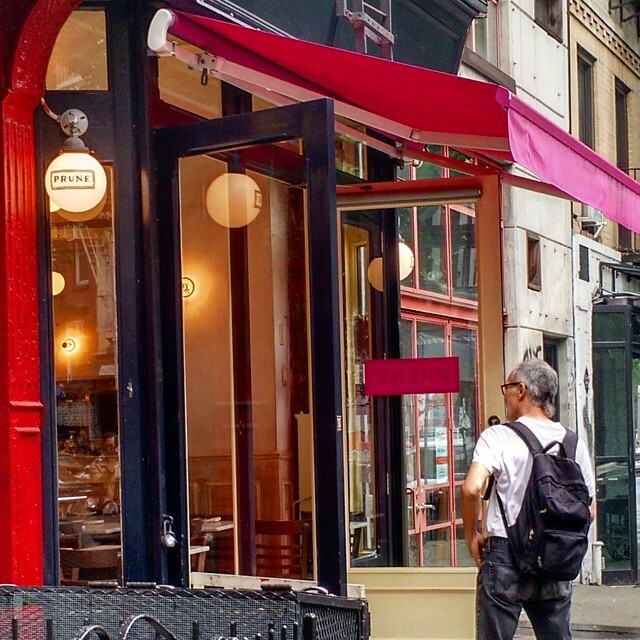 I threw my purchase away and went to find rugelah at Zabar’s deli (and it made me happy). Di Fara’s Pizza – Not exactly a cookbook, but a chapter in Delancey, a plain (in the positive sense) story about the road to opening a pizza place in Seattle, with recipes. Pizza research was involved, including at this Brooklyn eatery. 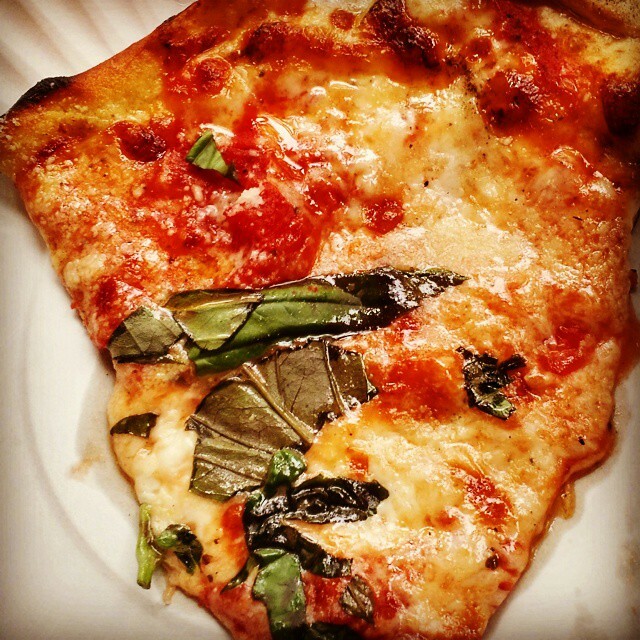 Look for lists of the best pizza in NYC and you’ll find ones with titles like “Best Pizza That Isn’t From Di Fara’s”. It reminded me that home pizza is all about the tinkering, like how long the dough rises (days, not hours), how important to get 00 flour (very), how to bake (this way, FYI). It’s the journey not the destination. Unless, of course, you’re opening a pizza place and writing a memoir about it. Based on this slice, my journey is going to next involve doubling the salt in the dough and doubling the rising time. 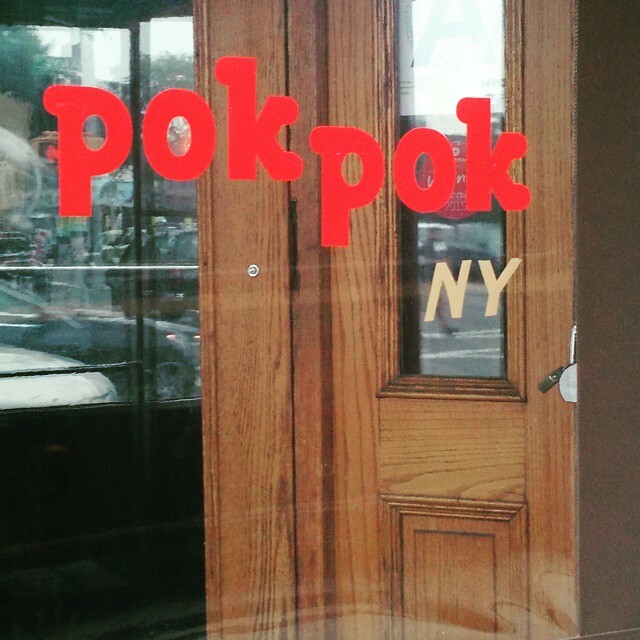 Pok Pok – I complained heartily about how difficult this Thai cookbook was, about how I respected the chef for not watering it down (he claims he didn’t) but I lacked the wherewithal to actually execute the dishes at home. Then, I went on a shopping trip to stock the right ingredient. Then, I forced myself to cook a many-course meal using the book. Then I did the same thing with a book called Simple Thai and discovered that Pok Pok really wasn’t any more complicated than the “simple” book. It looks harder than it is. Cooking these recipes may become my new Friday night hobby. As a side note – I never thought I’d say this about Thai food, but I’d adjust the recipes to make them much spicier (in the book and in the restaurant). I sampled cocktails, shrimp chips (not exactly a recipe, just a snack that should be in every bar), Sunny’s Glass Noodles and Green Papaya Salad with sticky rice. Robicelli’s Bakery – I loved that the cupcakes were the same size I’d make at home and the decorating on top wasn’t much fancier than piping the frosting on instead of smearing with a spoon. 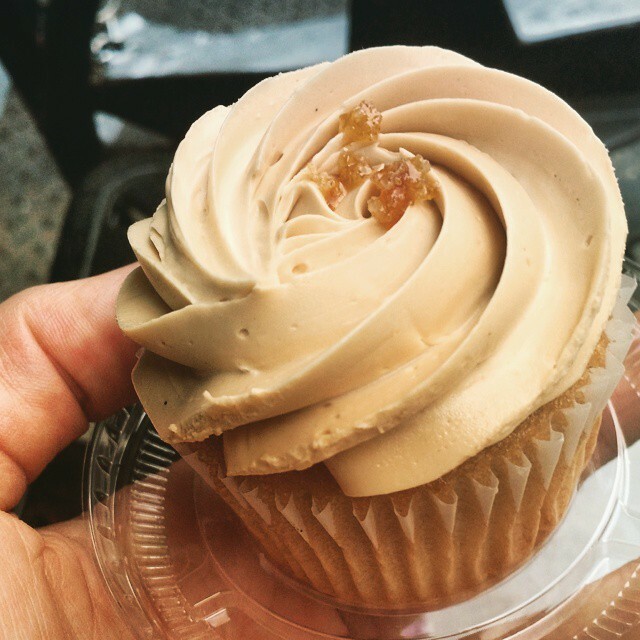 Here’s the thing: I don’t like buttercream. Robicelli’s French buttercream is the only buttercream I like and even then I’m not wild about it. What is wrong with me? I know this is a personal failing. High end cupcakes are 75% buttercream (these, thankfully, less than 50%). They’re a lot of work, and a lot of expensive ingredients, for something I’m going to throw away half of. I need to come up with buttercream-less variations on the lovely Robicelli’s flavors for myself, and make the normal ones for everyone else. (I bought the book for the writing, in case you’re wondering). I sampled the Tres Leches cupcake and Pistachio Cannoli cookie. Liddabit Sweets – Candy making is very algebraic. It’s true that things go wrong and injuries, not to mention burned sugar and unset caramel, often result, but there’s a lot of math-y logic. You have all these recipes for basic candies – nougats, marshmallows, hard candies, ganaches, caramels, honeycomb, jellies, spun sugar, syrups, chocolates. You have recipes for cookie layers, and also things like roasted nuts and crisped rice that add texture. You mix and match them in different ways to make monster candy creations. 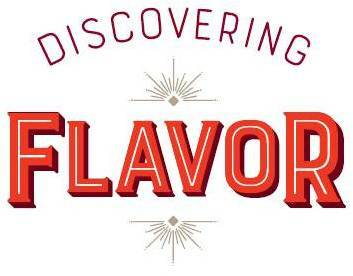 Or you flavor them with classy flavorings like anisette, blood orange, green tea, rum for simple elegant candy creations. Ta da. You may not end up with the candy you meant to invent, but it likely tastes good and you will never run out of things for experiments. It’s frustrating and time consuming and can’t be done when it’s humid and you can’t be afraid of very very hot sugar. 99% of people will not enjoy taking their candy energies beyond 15 minute fudge, microwave peanut brittle, and the occasional chocolate bark. Nor do they need to, that is why we have businesses like Liddabit Sweets. 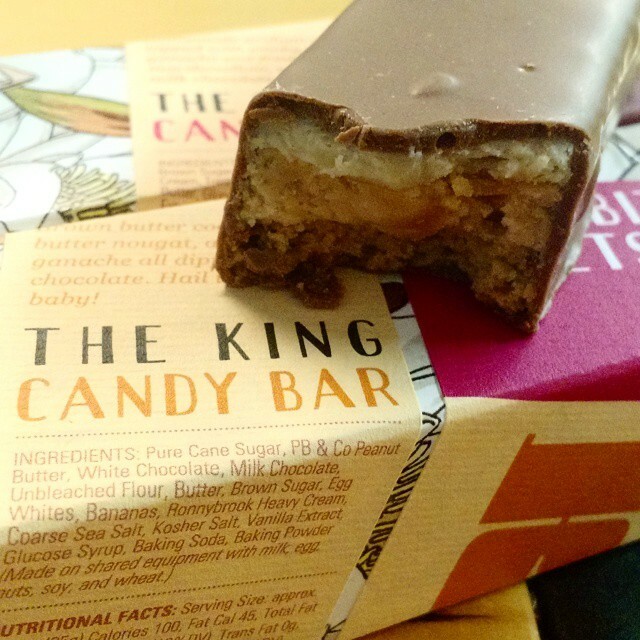 I sampled the King Candy Bar (peanut and banana) and S’Mores candy bar. Dominique Ansel’s Bakery – Dominique Ansel’s bakery is into perfection to the point of being off-putting (to me, not to the people who line up every morning for his Cronuts – the croissant/doughnut hybrids). His book is perfect to the point of requiring a culinary degree to pull it off. Some of the recipes are easier, and I’ve done those, and his kouign amann recipe produced something truly awesome. I got in line at the bakery thinking I’d go for ones I’ve made, the DKA or the Chocolate Pecan cookies, to do a decent comparison. 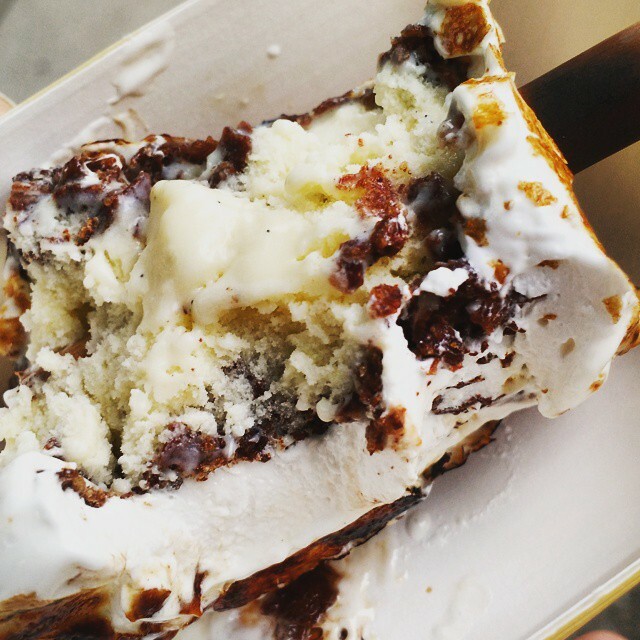 Then I thought: there is a Frozen S’More on the menu that involves putting vanilla ice cream, chocolate cookies, wrapped in marshmallow, on a giant stick and then taking a blow torch to it right at the ordering counter. At 8 in the morning I really needed to go there. So, I did. There was an audible gasp from the Cronut line waiters. I scarfed it on the spot and licked my fingers clean. It tasted like a S’More met an Ice Cream sandwich and settled down into marriage, and when I make my version, I’m going to use Alice Medrich’s trick of using chocolate intentionally taken out of temper so it won’t freeze solid and will readily melt in your mouth with the ice cream. Another resolution? To look at the exquisite Dominique Ansel masterpieces and come up with a way to make sloppy approximations that might not taste like the originals, but will undoubtedly taste really good. Other Stops of Note: Jin Noodles to figure out what the ramen I read about in Pretty Good #1: An American Family Eats Tokyo was like (or at least as close as I’ll get without traveling to Tokyo). Zabar’s and Barney Greengrass (can’t miss the delis). Four Horsemen (an excellent wine list . . . I’m only slightly biased by my friend Tobias curating said wine list, but now I know what Orange Wine is!). Morgenstern’s (oh lord, the ice cream. . . the ice cream. . . and sorbet).